Samsung Galaxy Note FE Review – While Samsung has definitely saved itself from the clamor brought by the Samsung Galaxy Note7 through the launch of the Samsung Galaxy Note8, the South Korean smartphone giant has not given up with the Note7 as it introduced the Samsung Galaxy Note Fan Edition (FE). 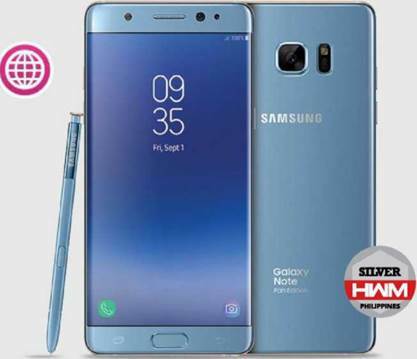 Known as the refurbished model of the Galaxy Note7, the Galaxy Note FE carries similar specs and features as the latter except for its battery which Samsung downsized to 3200mAh from 3500mAh, and the operating system which was changed to Android 7.0 Nougat from android 6.0 Marshmallow. On the outside, the Samsung Galaxy Note FE carries that familiar Samsung physique with its unibody design that holds its 5.7-inch Super AMOLED Quad HD curved screen. This display delivers images rich in colors, making it an apt device for high-quality video viewing and for games with rich and detailed graphics content. This is further complemented with its single speaker grille found at the bottom of the device which produces a well- balanced sound with minimal distortion. On the inside, the Samsung Galaxy Note FE runs on a Samsung Exynos 8890 octa-core processor coupled with a Mali T-880 GPU. For storage, this device comes with a combination of 4GB Ram and 64GB Rom (expandable up to 256GB). The Samsung Galaxy Note FE still has the Iris scanner which is another way of unlocking and accessing the device using your own eyes, which the company first introduced with the Galaxy Note 7. This still remains as one of our favorite features of the product, although some of Samsung’s latest handsets also have this. With regard to the imaging department, the device got a 12-megapixel F1.7 main camera plus a 5-megapixel F1.7 front camera. It’s main snapper, although a bit small in numerical value, rendered acceptable results especially when used under well-lit environments. That’s also maybe because of the dual-pixel technology applied to the camera. Night photography using the auto mode seemed a bit off to us, but when used with the professional mode, we’re able to get results close to what we wanted. We were able to use the Galaxy Note FE as our main driver for as much as a week, and the Galaxy Note FE survived up to nine hours of moderate to heavy usage. Although we felt its 3200mAh battery to be a bit short for daily usage, this dilemma was somehow solved by its fast charging capability which turned a 30-minute plug-in time to 42% of battery life. The Samsung Galaxy Note FE comes with the S-pen which helps in boosting users’ productivity. An acceptable option for the Note fans, the Samsung Galaxy Note FE retains what we loved about the samsung Galaxy note7 when we had the device in our lab over a year ago.